Portfolio — LOOK AT ART. GET PAID. Equitable Met proposes sliding scale as an alternative to The Met’s new $25 fee for visitors unable to demonstrate New York residence. But our message is broader: low income, undocumented, marginalized, first-time visitors matter. As Daniel Penny writes on Equitable Met in The Paris Review, this is a generationally significant moment for cultural justice in NYC, with deep resonance with past struggle. “Point of Purchase (POP)” augments familiar customer service interactions to reveal their uncanny underpinnings. Participants surrender their belongings to a uniformed stranger who labors over them in bizarre ways—a vulnerability expected of airline passengers and museum-goers. Fiction inspired by reality, this sample demonstrates our interest in modeling nearby worlds to prompt critique and reconsideration. While POP exaggerates our present, LAAGP imagines an alternative: What if the museum valued new visitors enough to pay them for their knowledge? As in POP, we center our participants in the meaning-making by inviting them to stage their own art interventions at the museum. Installed at RI’s Dunkin Donuts Convention Center, “Welcome to Rhode Island” presents a critical introduction to RI history and politics, juxtaposed against the brochure stand in the institution’s lobby. Brochures include "Gentrification in Providence" and "Slave Trade was RI's #1 Financial Activity,” as well as pamphlets representing local progressive organizations. While the tone is absurdist—visitors snack on Munchkins™ while they browse—the piece intervenes within a mainstream venue to highlight alternative histories and grassroots organizing efforts. While LAAGP engages directly with mainstream art institutions, we leverage our institutional access to work in solidarity with organizing that operates outside these spaces. Break Room is a collapsible mobile room that travels to various art museums. Inspired by critic feedback from our pilot, it offers a place for museum-goers to recharge and reflect. Amenities relieve and name the emotional, physical, and social labor of navigating implicit cultural codes in an elite white institution. 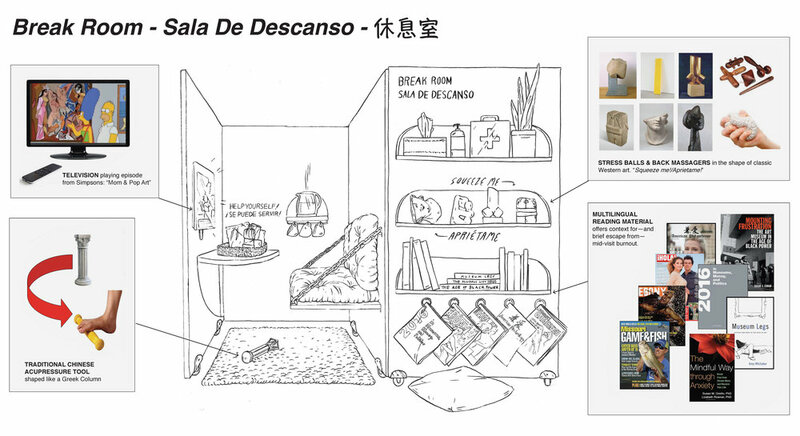 Multilingual wall text invites guests to refreshments and Brancusi-shaped stress balls. A curated set of books validate and contextualize diverse forms of art-induced fatigue. Break Room exemplifies the co-authored work that LAAGP generates. In D.C. we’ll hire local artists and critics to team up and create interventions at participating art museums. We will install six feather flags outside of RISD Museum, for passersby and approaching museum visitors to encounter. These flags will be on loan from local car dealerships to the RISD Museum. Look! Pre Owned! explores the discursive overlap between auto dealerships and museums, bringing into focus the vernacular of advertising by taking its materials out of context. It also taps into the similar economies of art loans and car leases/rentals.